This fully inclusive tour includes a range of sightseeing with bilingual guides, accommodation in 4 star hotels across Japan and transport throughout. This tour is designed for those who enjoy travelling with other like minded people. Upon your arrival in Tokyo today, you will be personally met by a representative of BCD Sports or our local Agent (English-speaking). A transfer is included into the City of Tokyo directly to your Hotel, where you will be staying for the next four-nights. After freshening up, join your Tour Host’s John and Ray McBeth for a Welcome Function this evening, including refreshments and canapés. This function will provide an opportunity for everyone to get together and meet their fellow travellers. After the function, John and Ray will provide some recommendations for an evening meal near-by to your hotel. Tokyo is one of the great metropolises of the World. Its 35 million inhabitants live well in the sprawling suburbs, and many commute every day into the centre through stations like Shinjuku. Tokyo’s world-famous public transportation system whisks passengers to their destination quickly, efficiently and reliably, making it easy to zip between locations in the capital at a moment’s notice. Tokyo today is a city that offers something for everyone. Throw yourself into the melee and venture out into the hubbub of thrumming, neon-lit main streets, criss-crossing train-tracks, and nostalgic narrow backstreets, offset by parks, shrines and temples offering much-needed pockets of calm. Tokyo’s main sights can be grouped together in a few key areas. 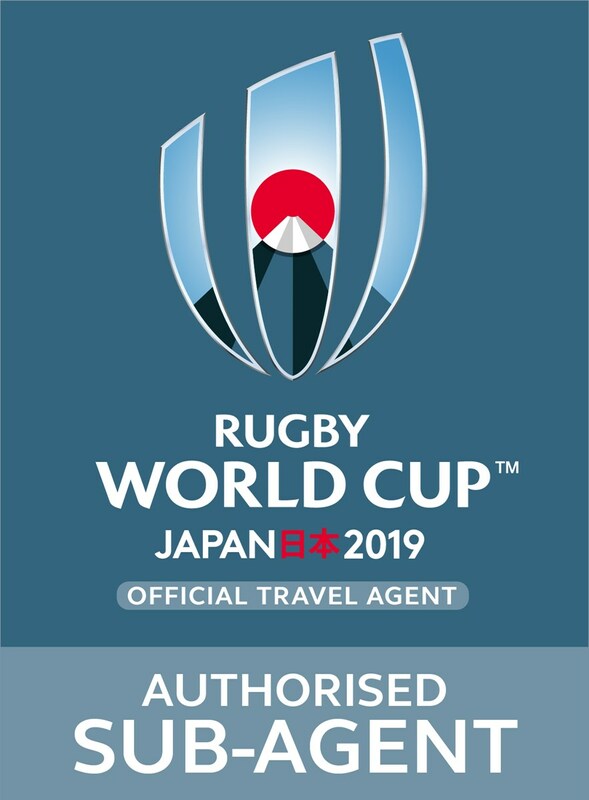 Over the coming months leading up to the RWC 2019™, BCD Sports will be providing unique and knowledgable insights into the City of Tokyo. They will come in the form of a regular newsletter with suggestions on places to see, restaurants to try and nightlife to explore. After a leisurely breakfast this morning, board your coach for an orientation tour of Tokyo. A bilingual guide will give you an overview of the city with visits to the Hamarikyu Japanese Gardens before enjoying a river cruise and a walk through the Asakusa and Nakamise districts. Lunch is included in today's tour. After lunch, drive-by the Imperial Palace before returning to your hotel mid-afternoon. The balance of the day and evening are free for you to explore or relax at your hotel. John and Ray will again provide some recommendations for an evening meal near-by to your hotel. This morning is free in Tokyo to explore your surroundings and enjoy this amazing city. John and Ray will be available to steer you in the right direction. This afternoon, take a local train from a station near-by your hotel, to the district of Chofu where the Tokyo Stadium is located. A SUICA Card with a stored amount of Yen to get you to / from the match will be included in your travel wallet. Simply pass through the turn-styles at each station, scanning your card and the fare is deducted automatically. Once the stored value gets low, you can top it up at vending machines located at various stations. English-speaking staff will be on hand to assist you to / from the stadium for each Rugby World Cup 2019™ match. It is said that the Tokyo train systems are the easiest of all the great cities to use, once you become familiar with it. This evenings quarter-final match in Tokyo Stadium is between the Winner of Pool B (hopefully New Zealand) and the Runner-up from Pool A (could be Ireland, Scotland or Japan). After the match, stay together as a group and return by train to your hotel for a celebration in a near-by bar. Today is another free day to explore until later this afternoon, when you will once again take the local train out to Tokyo Stadium for this evenings quarter-final match between the Winner of Pool A (could be Ireland, Scotland or Japan) and the Runner-up from Pool B (could be South Africa, Italy or NZ). After the match, stay together as a group and return by train to your hotel. This morning after breakfast, venture south to a very traditional region of Japan, Kyoto. Travel on the impressive Bullet train known as the Shinkansen for the two and a half hour journey to Kyoto. Your luggage will be transferred separately to save you lugging it through the busy train stations. An English-speaking local guide will travel with you for the next four-days, providing interpreter services, assistance through the rail stations, commentary on the sights tours and hotel check-in assistance. Deservedly one of Japan’s most popular destinations, this historic city has a wealth of temples, shrines and cultural practices to show off to visitors that almost everybody leaves with the same wish – a need for a few more days’ exploration. For temples, visit the Kiyomizu-dera Temple, where the startling no-nail structure is second only to the stunning views of the city you’ll get from its platforms. The Golden Pavilion is every bit as beautiful as you’ll have seen in the pictures and offers visitors the chance to stroll through its surrounding gardens, admiring the structure from every angle. Fushimi Inari Taisha shrine is filled with 10,000 bright orange ‘torii’ gates which you can wander beneath. Be sure to walk further enough to escape the crowds and enjoy the serenity the shrine offers. If it’s geisha-spotting you’re hoping for, you can choose between the expensive option - booking a private dinner and dance, giving you the authentic experience - or the cheaper alternative, Gion Corner. This is reputedly the best spot for capturing a glimpse of Kyoto’s geiko and maiko san – though sightings are never guaranteed. Upon arrival in Kyoto you will be taken on a sightseeing tour of Kyoto with your first stop being a Maiko performance and Kaiseki lunch. The tour will then continue taking in sights such as the Kyoto Imperial Palace, Kinkaku-ji Temple (Golden Pavilion), Bamboo Forest and Arashiyama. At the end of the tour head to your hotel, where you will be staying for the next two-nights to check-in and unwind. Today is free to relax and discover this wonderfully preserved traditional city. John and Ray, along with the English-speaking guide, will take those who are interested for a walk through the city this morning. Visit the Nishiki Market, stroll along the river banks of the Kamo-gawa and around the Gion district, the famous old entertainment and geisha quarter. John and Ray will no doubt suggest a restaurant to the party this evening. This morning, assemble after breakfast, ready to move on to the next adventure. Your luggage will be transferred separately by truck to your Osaka hotel. Transfer back to Kyoto Station this morning and board the Shinkansen for the journey further south Hiroshima (1 hour 50 minutes), a modern city with a tragic past. On arrival board a coach for an orientation tour of the city. First visit is to Orizuru Tower, followed by an included Okonomiyaki lunch, a Hiroshima specialty. After lunch visit the Peace Memorial Park, the A-Bomb Dome and Museum. Late in the afternoon, transfer back to Hiroshima Station and return north to Osaka on the Shinkansen train (90 minutes). At Osaka, transfer by coach to your hotel, where you will be staying for the next two-nights to check in. John and Ray will have some suggestions for this evenings meal and your English-speaking guide will be on hand to assist if required. Today is a free day in this modern and progressive city. John and Ray, along with your English-speaking guide, will take those who are interested, on a walk around central Osaka. This morning after breakfast you will travel back to Tokyo for the big semi-final weekend. Your luggage will be transferred separately by truck to your Tokyo hotel. From Osaka Station board the Shinkansen Bullet train to Tokyo Central Station and transfer by coach to your hotel, where you will be staying for the next three-nights to check in. The rest of the day is free to explore the local area. John and Ray will be available to steer you in the right direction should you need. This morning is free to relax or go out and explore. The Tajiki Fish Market is worth a visit and while you need to be there before dawn to get a place on the auction floor, it is possible to go a bit later and catch the atmosphere and frenetic activity as traders vie to get their fresh fish out to the market. Around the Tajiki Market there are many excellent Sushi Bars and Café all serving fresh fish and healthy breakfast fare. This is well worth a visit. Early this afternoon, join together with your fellow tour members and take a local train to todays Rugby World Cup 2019™ semi-final match being played at International Stadium Yokohama. Our local Agent will provide English-speaking staff to assist you through the stations and onto the trains for each match. If New Zealand finish first in their pool and then win their quarter-final, they will play in semi-final 1 this evening. If they finish second in their pool, but then win their quarter-final, they will play in semi-final 2 tomorrow evening. After the match return by train to your hotel for a celebration in a near-by bar. This morning is once again free to relax or explore. Early this afternoon, join together with your fellow tour members and re-trace your steps from yesterday, taking the local train to Yokohama for today’s second semi-final match. After the match return by train to your hotel. This morning after breakfast, be sure to gather your belongings ready for another fascinating adventure south to the stunning region Island of Kyushu. An English-speaking local guide will travel with you for the next four-days, providing interpreter services, assistance through airports, commentary on the sights tours and check-in assistance as needed. Transfer by coach to Tokyo Haneda Airport located in Tokyo Bay for your ANA flight (2 hours) to Kyushu’s Fukuoka Airport. From the Airport enjoy an orientation tour of the Fukuoka / Hakata area with a stop for a lunch; Mizutaki chicken hot pot – a traditional Hakata dish. Later, visit the Daizaifu Tenmangu Shrine before returning to downtown Fukuoka and your hotel, where you will be staying for the next three-nights. This evening, along with your English-speaking guide, tour hosts John and Ray will take you to Hakata’s famous night food market area along the river. Eating is at your own expense, but this is sure to be a highlight of your time in Fukuoka. Today enjoy a fascinating day trip out of Fukuoka to the Oita Prefecture and the city of Beppu. This charming old city with its bath houses and steam rising from adorned vents, is certainly touristy, but at the same time quite quaint, modern, traditional and rickety. An Onsen bathing experience is included (so bring your togs) as well as lunch at a local restaurant. Later in the day, return to Fukuoka and your hotel. Today enjoy a second unique day trip commencing with a cruise upon the Yanagawa River before visiting the last Samurai stronghold of Kumamoto Castle. An included lunch follows in Kumamoto then as you drive back up the Island, catch glimpses of Mt Aso, part of the crater of the gigantic caldera in the middle of Kyushu. After breakfast this morning transfer back to Fukuoka Airport and fly back north on an ANA flight to Tokyo’s Haneda Airport. On arrival you will be transferred by coach to your central Tokyo hotel for the last few nights of your tour, for your three-night stay. Today is free to relax and enjoy the sights of this great city and the build-up for tomorrow’s Final. Your tour hosts John and Ray may suggest a final tour lunch or dinner together? This morning is free for last minute shopping and packing in preparation for the flights home. Early this afternoon, as a group, head to Yokohama for today’s Rugby World Cup 2019™ final at International Stadium Yokohama. After the match return by train to your hotel for a celebration in a near-by bar. Hopefully your team has won! Today BCD Sports will provide one transfer to Tokyo Narita Airport and one to Tokyo Haneda Airport to coincide with the majority departure flight time. If you have booked a flight from an airport other than the Group departure, BCD Sports can arrange departure transfers on an individual basis at an extra cost. More details to come. Note; flights are not included in your package price and will be additional to this, apart from those mentioned. Following is a brief itinerary outlining your time in Japan. Please note this is subject to change and a final itinerary will be sent with your documentation closer to departure.